Smooth cut-out securely holds the original magnetic charger in place, concealed channel keep the redundant cable neat. The Dock is designed with a housing compartment underneath to neatly store all excessive cable lengths to keep out of eye sight for maximum organization. A compact table organizer by design. and watch while working on projects. Watch videos, use FaceTime. All hands-free. Works with almost any phone and case. Even small tablets like iPad mini and Kindle Fire. Aluminum alloy material,surface polishing process,rubber protection.Fully metal body ensures strong stability,protect your iphone/iwatch from scratches and sliding, charge your devices simultaneously and securely in place. 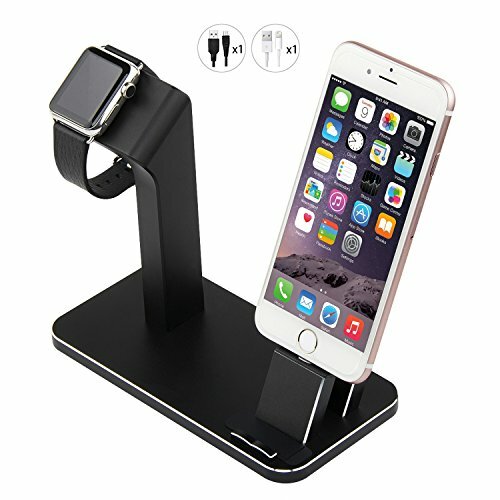 Great night stand for Apple Watch and iPhone, supports comfortable vertical viewing angle for Facetime,Skype, watching or making videos, supports for iPhone with different thickness case. Big convenience, Best Christmas Gift.Perfectly decorates your bedroom, study, hall, office, kitchen,dining table,mobile phone store. If you have any questions about this product by Aisni, contact us by completing and submitting the form below. If you are looking for a specif part number, please include it with your message.